1. It is set in a well-constructed and interesting future universe. Marissa Meyer has given thought to the history of her world and to how this history influences the present time and the fears and actions of those who inhabit it. 2. 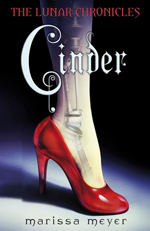 It uses the Cinderella fairytale as inspiration, not as a blueprint. Often, retellings are just that, with no real creativity or innovation involved. Here, you can see the elements of the original story, but they’re used in a way that feels authentic within the setting. 3. It has a strong female lead. Cinder has plenty of insecurities, but she just gets on with her life despite these and despite her less-than-wonderful living situation. She’s a talented mechanic, devoted to the people she cares about and selfless when it matters, rather than as her standard. 4. It’s entertaining and well-plotted. The pacing is good and there is a strong mix of characters who do not feel like unaltered archetypes. Better still, the romantic lead has a lot more going for him than his looks – and he treats Cinder with respect. 5. It’s about a CYBORG OMG. Cyborgs are essentially my science fiction thing. 1. It contains a “twist” that is readily apparent almost from the very beginning of the book. Regardless of whether Meyer wanted her readers to be aware of this before Cinder, I always feel a bit duped when the big reveal is something I’ve known all along. 2. It is not a fully-contained novel, but rather the first quarter of a complete story. This is my biggest gripe with Cinder. I know series are the big thing right now, but every novel within a series should be able to be read and enjoyed as a book in its own right. I didn’t feel that with Cinder. It’s good enough that I will read Scarlett anyway, but the lack of any closure is annoying nonetheless.